Wyberton want to make it three wins in a row against Nettleham - but boss Joe Greswell says the hosts will be ‘gunning’ for his side. The Colts have beaten their opponents 3-0 twice at The Causeway this season, in both the Lincs League and Supplementary Cup. But as they hit the road this Saturday, keen to bounce back from their 4-3 defeat to leaders Lincoln Moorlands Railway, they are expecting a little extra sting from the Nettles. “After beating them twice already at home, I know they will be gunning for us on Saturday,” Greswell said. “They felt they were unlucky both times they faced us and should have won at least one of them. Indeed, Greswell expects Nettleham to make the most of home advantage. “They play on such a big pitch, which is a lot different to ours,” he said. “It might suit them more then it does us. 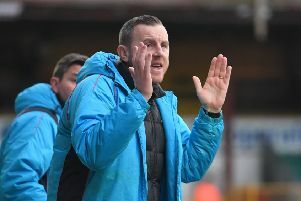 “We know it’s important to win our three remaining games going into our (Supplementary Cup) final and I’m looking for a reaction after Saturday’s defeat.